Changes in banking and securities regulation in many countries since 1980 have allowed banks to expand their range of financial services far beyond mere lending – an opportunity banks have been eager to grasp. This business development entails a responsibility of offering informed advice on the choices that customers must make. If we are to judge by a steadily increasing stream of lawsuits, as well as the clear results of customer surveys, most banks fail this part of the challenge. Should the law intervene? That is the basic question posed by this important book. 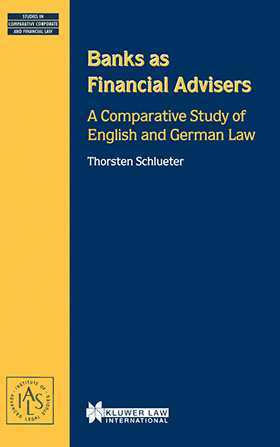 In examining and evaluating the complex answer, and its critical implications for the banking industry, the author uses a comparison of legal systems, developments, and events in two major banking jurisdictions, England and Germany. He investigates the relations in each system between the relevant legal rules and actual business practices in order to analyze such issues as the following: The adequacy of current legal concepts defining a bank's duties with regard to financial advice; `Mis-selling' of financial products; The socio-economic context of the bank/customer relationship; Governmental regulation and supervision; The English and German Ombudsman schemes; and Potential new statutory provisions setting standards for providers of financial services. Banks as Financial Advisers contributes significantly to the development of practical solutions to a serious problem in today's banking business practice. Banks and their counsel, financial regulatory officials, and other financial services professionals will find it of great value. Useful appendices contain all relevant English and German statutory provisions in force at the time of publication.